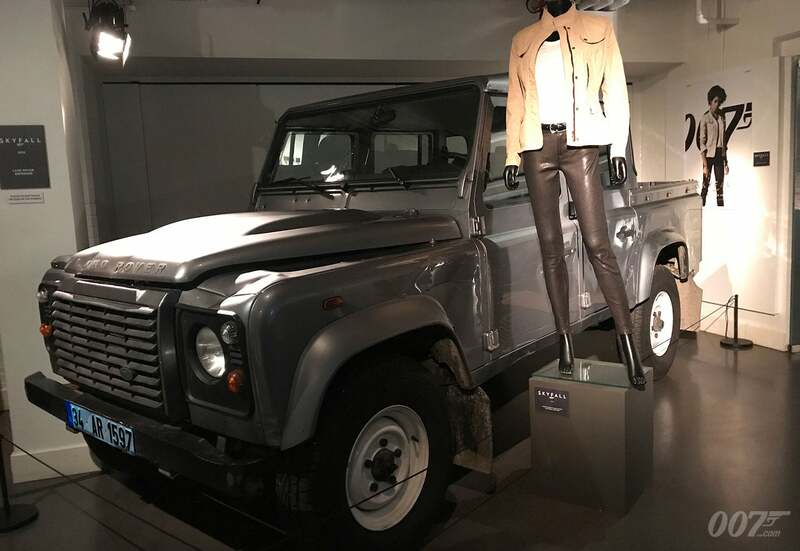 This year, Bond In Motion at London Film Museum have installed a new display of original film cars driven by some of the female characters. Complemented by previously unseen costumes, props and storyboards, it is a celebration of the series’ memorable women and the cars they drove. Tania Mallet playing Tilly Masterson in GOLDFINGER in 1964 became the first actress to drive a car in a Bond film. The Mustang she drove was a pre-production car acquired from Ford especially for the production. 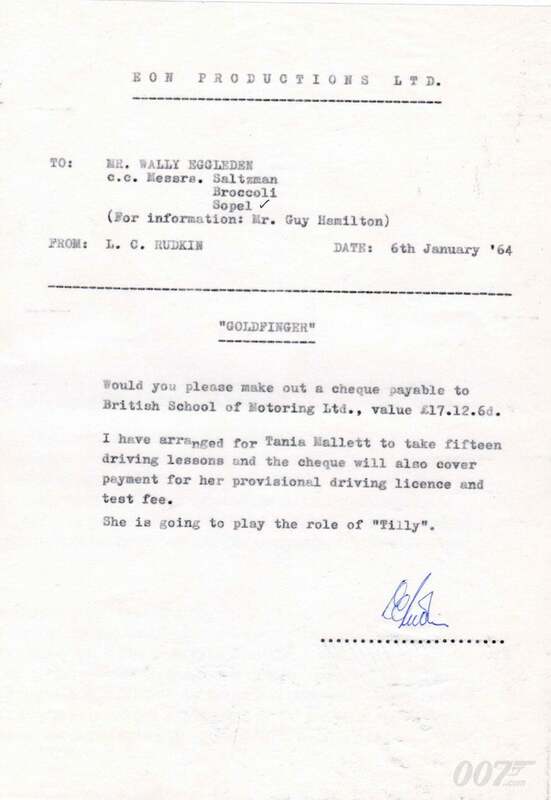 The exhibition contains an original production memo from January 1964 requesting driving lessons for Tania Mallet. 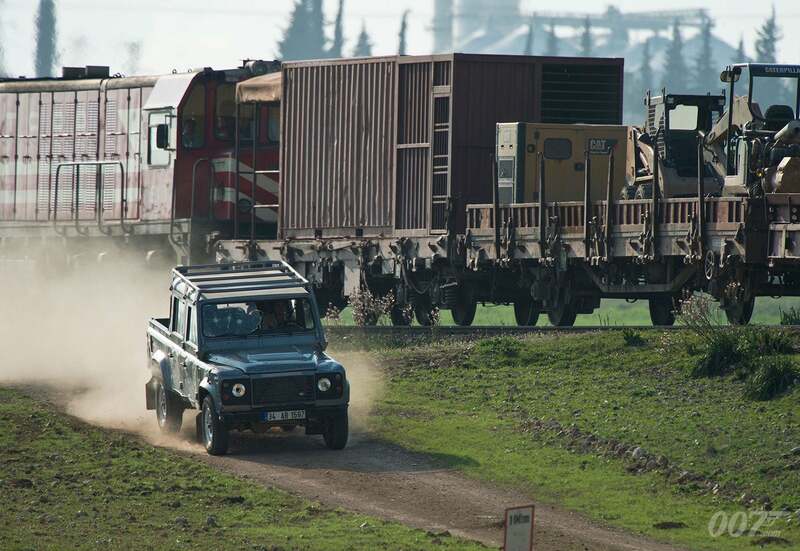 Cars new to Bond In Motion include the Land Rover Double Defender Cab used by Moneypenny (Naomie Harris) to pursue the mercenary Patrice (Ola Rapace) through the streets of Istanbul in SKYFALL (2012). Accompanying the car, other items from SKYFALL are Moneypenny’s costume, a storyboard by Jim Cornish depicting the sequence where Moneypenny chases the train whilst driving the Land Rover and a clapperboard signed by Daniel Craig, Sam Mendes, Naomie Harris, Bérénice Marlohe and Javier Bardem. 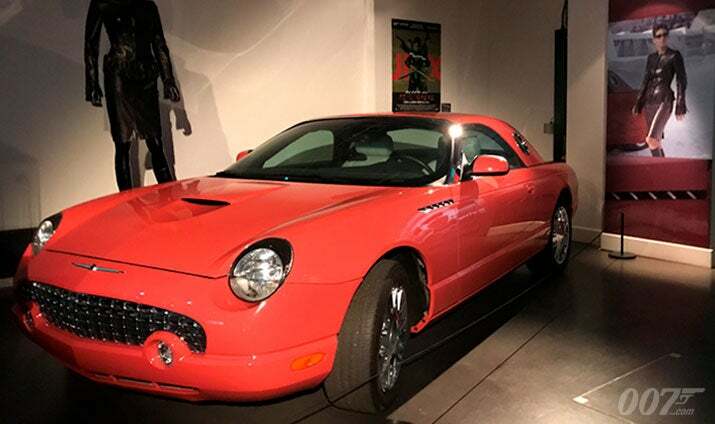 Also new to the exhibition is the Ford Thunderbird driven by Jinx (Halle Berry) in DIE ANOTHER DAY (2002). Jinx, posing as Miss Swift from Space & Technology magazine, arrives in style at Gustav Graves’ spectacular ice palace in Iceland in a coral Thunderbird — it is the 2003 model secured early by the 2002 production. The Thunderbird is joined by Jinx’s costume — Versace leather jacket and skirt, Gina leather stiletto boots — and additional props from the film. The Ford KA, driven by Camille (Olga Kurylenko) in QUANTUM OF SOLACE, is also featured with one of her costumes created by Jasper Conran. 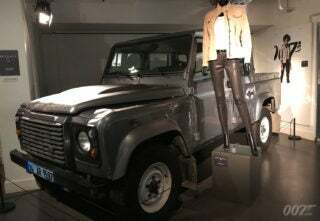 The exhibition has over 100 individual items on display including the Aston Martin DB5 from GOLDENEYE (1995), the ‘Wet Nellie’ Lotus Esprit S1 from THE SPY WHO LOVED ME (1977), the Rolls-Royce Phantom III from GOLDFINGER (1964), and the ‘Little Nellie’ Wallis WA-116 Autogyro from YOU ONLY LIVE TWICE (1967). To celebrate the new exhibits, Bond In Motion is offering 2-for-1 tickets until the end of 2017 using the code GP001.